A steam shower generator plays an integral role in the residential steam shower system and can provide effective holistic therapy for a weary soul. There are many manufacturers that produce steam shower generators, so you’ve got to do your homework before diving in. I wrote a few articles awhile back on a Victorian style home that was recently built in Marietta for one of Georgia’s most prominent citizens. The home is absolutely magnificent — inside and out. The homeowners had some very cool custom features added during the construction phase, including a steam shower. The homeowners had a steam shower generator installed for the master suite bathroom that few homes could match in quality and features. I’ll talk more about the actual steam shower in a future post. 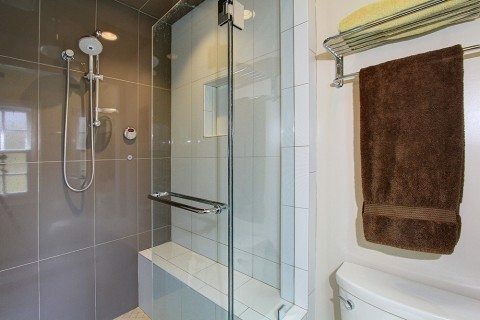 A steam shower is a small enclosure, much like a regular shower, that has a vapor-tight door with a steam shower generator supplying all of the steam. Of course, a steam shower room is nothing without a steam shower generator. The steam shower room can be a modular unit or a custom enclosure constructed with wall-to-wall mortared tile or natural stone. The tile or stone must be set in a mortar bed and not on a water-resistant drywall material. Steam will not penetrate mortar but will damage water-resistant drywall backer board beyond repair and may even penetrate walls creating even more havoc in your home, including mold and mildew. First and foremost, make sure that the bathroom will be able to handle the excess moisture created from the steam shower through fans that vent to the outdoors. Be sure to install the steam shower generator within 20 to 25 feet of the steam shower enclosure. Size your generator accordingly for the steam shower room enclosure. Your contractor can assist you with this process. Here is a straightforward steam shower generator sizing guide calculator to assist you. Your steam shower generator should have a 1-3 year warranty. The steam shower generator should be able to quickly boil water to produce an adequate amount of steam within a few minutes. 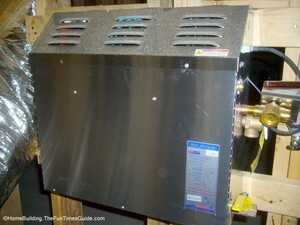 The steam shower generator should run quietly and produce steam evenly on a consistent basis. This project is not for amateurs. There are many logistical issues involved with installing a steam shower generator so I suggest that you go with a pro. Interview several plumbing contractors that have numerous installations under their belt. 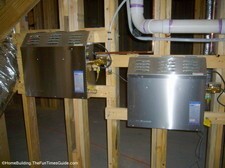 The photos above show the steam generators for the Victorian home‘s master bathroom. They are tucked away in the basement under the stairwell with an access door.